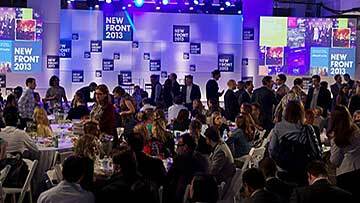 In the fourth annual NewFront conference in Manhattan, specialists explored the up and coming arena of branded entertainment in the online platform. During the event—which was hosted by Digitas—representatives from brand marketing and advertising communities, as well as celebrities, talked about getting producers and brands to work together. In fact, some Hollywood actors pitched their respective online series and were looking for partners. Mark Beeching—Digitas’ worldwide chief creative officer—posed the question: “How do brands and content creators get into bed together?”And how do they do so with the influence of mass media. Some of the notable names that were in attendance included: Zachary Quinto, Ashton Kutcher, and Demi Moore. For more information about the conference, visit this link.